The Environmental Working Group (EWG) has released its 2017 Shopper’s Guide to Pesticides in Produce. The report includes a “Dirty Dozen” list that features produce with the highest amount of pesticides. There is also a “Clean 15” summary of the produce items with the fewest pesticides. Since 2004, EWG has ranked 48 popular vegetables and fruits each year. The guide is based on findings from over 35,200 samples of produce tested by the Food and Drug Administration and the U.S. Department of Agriculture. The samples used for testing pesticides have been thoroughly washed and, when applicable, also peeled. This year’s annual EWG report found almost 70% of 48 non-organic samples tested positive for at least one pesticide. The USDA researchers found a total of 178 different pesticides analyzed from the thousands of produce samples. 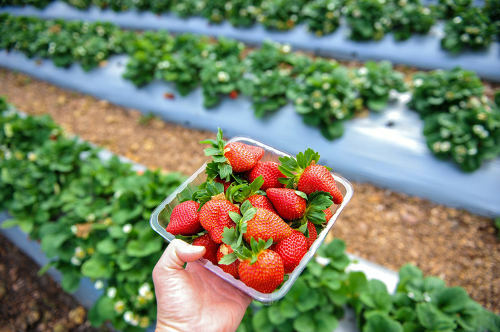 Strawberries topped the list for the second consecutive year, but what stood out is that a single strawberry sample contained 20 different pesticide residues. The 2017 guide features 51 entries because domestic and imported versions of blueberries, snap peas, and green beans showed drastically different results and were ranked separately. Each food listed on the Dirty Dozen tested positive for a variety of different pesticide residues and contained higher pesticide concentrations than the other produce. Pears and potatoes replaced cherry tomatoes and cucumbers from the 2016 list. However, that doesn’t mean that conventional cucumbers and cherry tomatoes are any safer to eat. Nearly all samples of spinach, peaches, strawberries, cherries, nectarines, and apples tested positive for at least one pesticide. On average, spinach samples contained twice as much pesticide residue by weight than the other crops tested. About 75% of tested spinach had residues of a neurotoxic pesticide banned in Europe. It is a type of pesticide that shows links to behavioral disorders. Since 2010, the amount of pesticide residues on pears has more than doubled from 0.6 parts per million to 1.3 parts per million. Overall, there were over 20 pesticides on pear samples—up from nine in 2010. The most common fungicides found on pears include carbendazim, diphenylamine, and acetamiprid and imidacloprid. * A small amount of papaya, sweet corn, and summer squash in the U.S. is produced from GMO seeds. As a result, it is best to buy organic varieties to avoid genetically modified produce. 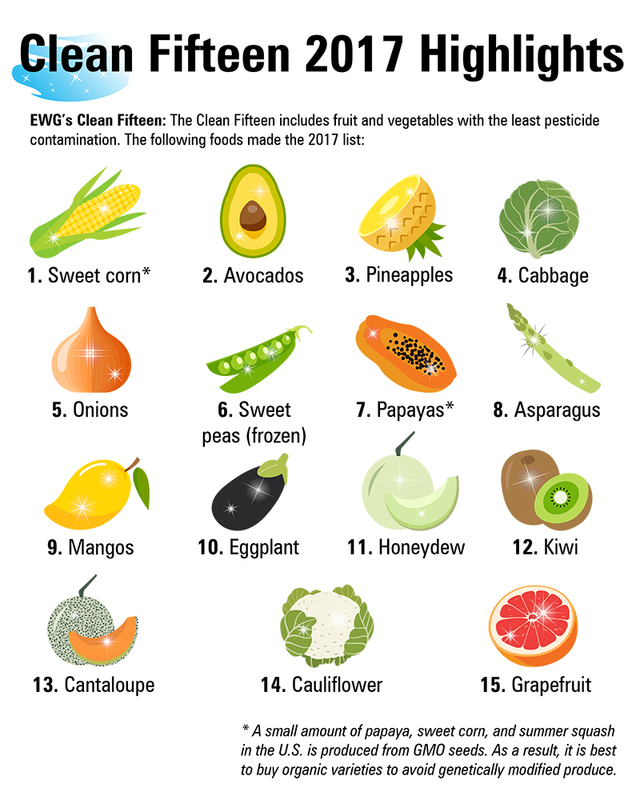 The Clean 15 are the foods featured at the end of the EWG report, and the list begins with the foods that contain the least amount of pesticides, followed by the next cleanest foods on the list. Overall, relatively few pesticides were found on these foods, and the tests discovered low pesticide residue concentrations. Multiple pesticide residues are very rare with the Clean 15 foods, and only 5 percent of the samples had two or more pesticides. No single fruit from the Clean 15 tested positive for over four types of pesticides. Sweet corn and avocados were the cleanest foods on the list, with only 1 percent of samples showing any amount of pesticides. Over 80% of cabbage, onions, asparagus, papayas, and pineapples had zero pesticide residues. What GMOs Are Listed on the EWG Shopper’s Guide? Genetically modified organisms (GMOs) are often not found in the produce section of your local supermarket. It is the processed food you have to worry about. Approximately 70% of all products contain genetically modified materials. The most common GMO crops include corn, canola, and soybeans. Corn and soybean derivatives can also show up in food products under other names like cornstarch, high-fructose corn syrup, soy protein isolates, and soy lecithin. Certain foods featured on the lists compiled from the EWG are genetically modified, including zucchini (aka summer squash), sweet corn, and papaya. Most Hawaiian papaya is considered genetically modified, while the USDA may approve other varieties of GMO crops in the future. Making smart choices when it comes to produce matters. Research shows that people who eat organic consume fewer pesticides. A study published in the Environmental Health Perspectives in 2015 reported people that often or always buy organic produce have significantly less organophosphate insecticides in their urine samples. The people in the study reported eating 70% more servings of vegetables and fruit daily than those who rarely or never purchased organic produce. Long-term observational studies also indicate that organophosphate insecticides may contribute to brain development in children. Pesticides have been linked to dozens of health problems, such as autism, ADHD (attention-deficit hyperactivity disorder), Parkinson’s disease, and certain cancers. When you shop, bring the Dirty Dozen and Clean 15 lists along. This will help for people on a budget that cannot afford to purchase everything organic. Organic produce can be more expensive than conventional produce. Farmer’s markets, community supported agriculture (CSA) programs, and food co-ops are cost-effective ways for choosing organic produce. Building a relationship with your local farmer may also lead to significant and affordable bulk purchases of organic produce at the end of the growing season. Although gardening is hard work, growing your food is an inexpensive way to produce pesticide-free food. Tower gardens and containers are ways to grow organic right inside your home. The EWG lists should not prevent you from eating vegetables and fruit, but it should make you concerned about modern chemical farming. Chemicals may be used to kills weeds, bugs, and microbes, and fumigate the soil; however this process isn’t without its unwanted side effects like killing beneficial microbes and healthy soil. Pesticides are also linked to a number of health concerns like Parkinson’s disease, autism, and various cancers. That is why using the Dirty Dozen and Clean 15 as a guide is a step in the right direction for improving your health. Is Organic Produce Actually a Waste of Money? 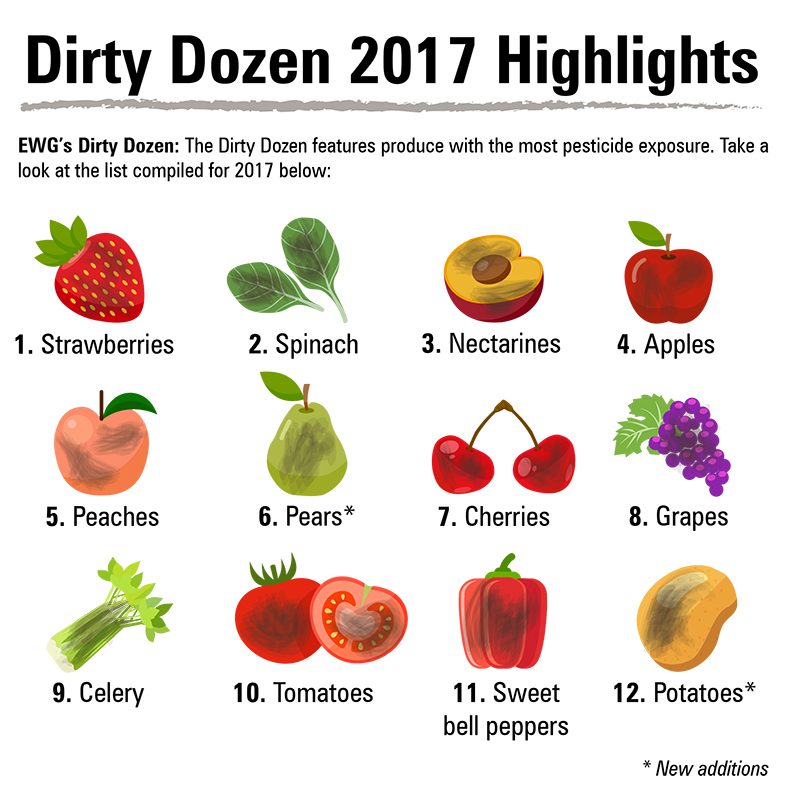 “The 2017 Dirty Dozen: Strawberries, Spinach Top EWG’s List of Pesticides in Produce,” EWG website, March 8, 2017; http://www.ewg.org/release/2017-dirty-dozen-strawberries-spinach-top-ewgs-list-pesticides-produce. Chai, C., “The Dirty Dozen and Clean 15: 2017’s list of fruits, vegetables with the most pesticides,” Global News website, March 8, 2017; http://globalnews.ca/news/3296249/the-dirty-dozen-and-clean-15-2017s-list-of-fruits-vegetables-with-the-most-pesticides/. “All 48 Fruits and Vegetables with Pesticide Residue Data,” EWG website; https://www.ewg.org/foodnews/list.php, last accessed March 10, 2017. “About EWG’s Shopper’s Guide to Pesticides in Produce,” EWG website; https://www.ewg.org/foodnews/about.php, last accessed March 10, 2017. “Executive Summary: EWG’s 2017 Shopper’s Guide to Pesticide in Produce,” EWG website; https://www.ewg.org/foodnews/summary.php, last accessed March 10, 2017. “Dirty Dozen,” EWG website; https://www.ewg.org/foodnews/dirty_dozen_list.php, last accessed March 10, 2017. “Clean Fifteen,” EWG website; https://www.ewg.org/foodnews/clean_fifteen_list.php, last accessed March 10, 2017. Curl, C., et al., “Estimating Pesticide Exposure from Dietary Intake and Organic Food Choices: The Multi-Ethnic Study of Atherosclerosis (MESA),” Environmental Health Perspectives, May 2015, 123(5), doi: 10.1289/eph.1408197. “Pears, Now with an Extra Helping of Pesticides, Join the Dirty Dozen,” EWG website; https://www.ewg.org/foodnews/pears.php, last accessed March 10, 2017.